In Hong Kong it may be advisable to avoid eating bottom feeders like oysters and shellfish from the area because of the water quality, but fish markets are full of styrofoam boxes filled with water and flapping fish the size of a cat. I love going to a stall and selecting my fish from a squirming array of mackerel, then throwing it on a flaming hot barbeque with a sliced lime in its belly. The scaly skin crisps up while the center of the fish remains juicy and tender. 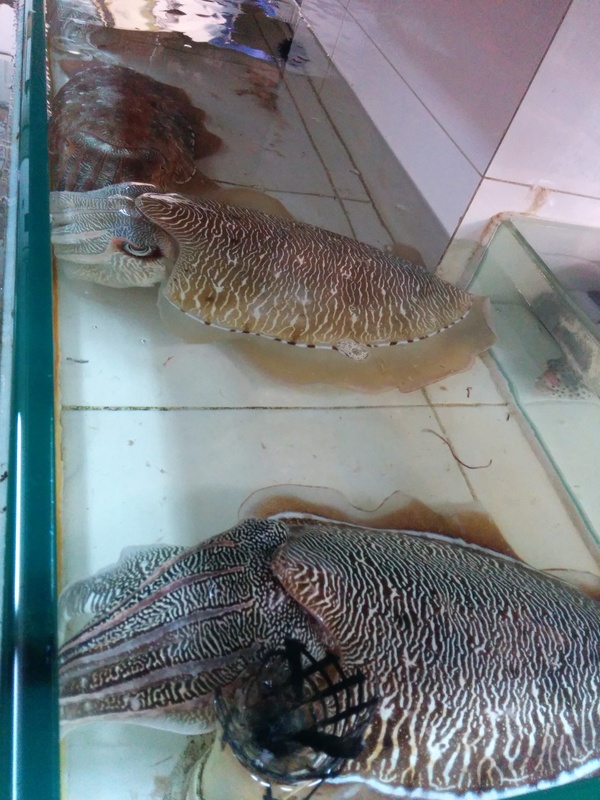 The wetmarkets always offer a wealth of opportunities for adventure in this regard; you can choose from squid and shrimps and prawns and fish and eel and abalone any sort of seafood. 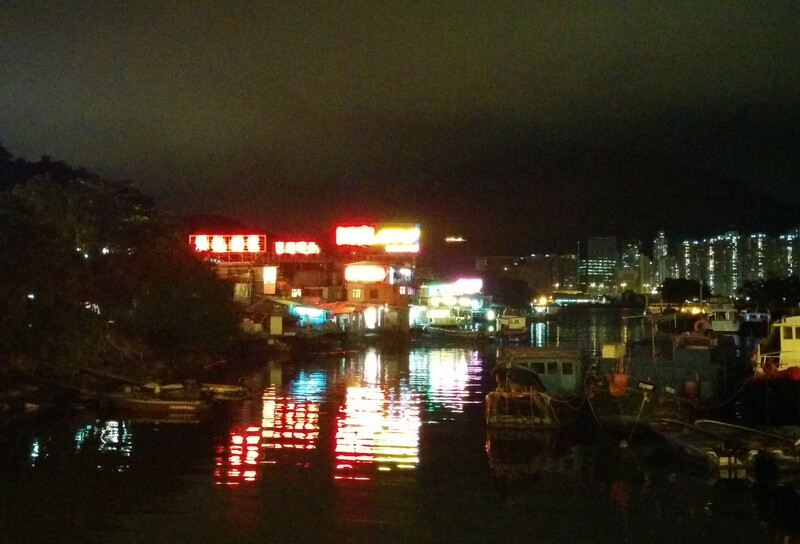 In this vein, we headed over to Lei Yue Mun a couple weeks ago to see the seafood village and have good eats. We had only seen it from afar before, either from a junk or from the Quarry Bay Promenade, but it looked like it might have potential. I didn’t really know what to expect; would we be eating rice on a boat, grilling shrimps on a bbq on the water, or sitting in a posh restaurant? I imagined plastic stools and a fire cooked squid with rain pouring through trees overhead as we trekked the 500m from the Yau Tong MTR to the waterfront. What we discovered was much more fun. As we approached we passed under an officious arch (built in 2003 by the “Tourism District Enhancing program, according to their website) informing us of our arrival, and a short, well groomed, brick-paved promenade. Neon signs glowed across the inlet littered with boats. As we continued down the path we wandered by the first sets of restaurants, made to get people before they even go through the market, and a small playground. Then we were surrounded by tanks of fish. The restaurant touts surrounding us promised outdoor seating and fresh fish, and we wound our way through the tanks and occasional knick-knack shop, ooing and ahhing at the odd assortment of oversized specimens. There were a few sections of market, punctuated by play areas–a hopscotch patch, a basketball court–and at the end a Tin Hau Temple near a small lighthouse to warn of the edge of rocks. We decided on the last restaurant in the mess, and were escorted to their partner fish stall. We chose our fish and mantis prawns, neglected to bargain on the price (which you should always remember to do in Hong Kong, we’re silly foreigners), then headed back to the restaurant. At first they were going to seat us inside, as is the preferred thing to do in Hong Kong, but we asked for a roof table, and they made up a four person set in the best possible location in the entire market. We sat on the corner of the rooftop terrace, overlooking the entire eastern harbor. After confirming how we’d like our seafood cooked, pouring us tea, and bringing us some Tsing Tao (only the classiest beverages for us), they took our order for vegetables and rice. We chose eggplant, black fungus with gluten (a favorite of mine) and a basic fried rice. From then on the evening was even more effortless. Food came in waves, with the mantis prawns covered in garlic salt first, which was served with two pairs of scissors for easy access to the meat. Grilled mantis prawn with garlic never disappoints: it is meaty, filling, tasty, and weirdly purple. E: “No, but with reviews like that I have to.” Waits a moment. We proceeded to order more. The second batch wasn’t quite as good, they didn’t have the garlic salt on top, but the texture was still ideal. Maybe they got lucky on that first order, but it was absolutely stunning. Then the proper fish came on its massive platter. It was also good, but I think after the eggplant we were all a bit underwhelmed by everything that wasn’t perfection or the best iteration of that item we’d ever eaten. The bill came, and it was a bit much [600 HKD a person], but that is to be expected. The price makes it so that I won’t go back every week, but the experience was well worth it. The night was a combination of beautiful views of the harbor with cruise ships sailing out into international waters, excellent freshly selected seafood, fairly good service, and a new wetmarket experience. It felt like a holiday dinner in Thailand instead of a fancy seafood restaurant in the Hong Kong metropolis. I am mostly shocked that I haven’t heard about it from many other people in the past.